Frankie Knuckles (front) in October 2012. 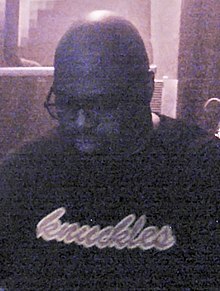 Francis Warren Nicholls, Jr. (January 18, 1955 – March 31, 2014), better known by his stage name Frankie Knuckles, was an American DJ, record producer, and remixer. He played a major role in house music in Chicago, Illinois during the 1980s when it was made. In 2005, he was added to the Dance Music Hall of Fame for his achievements. He was born in the Bronx borough of New York City. He was gay. Knuckles died from complications of diabetes on March 31, 2014 in Chicago. He was 59 years old. ↑ Busby, Cec (April 1, 2014). "Iconic DJ Frankie Knuckles rumoured dead". Gay News Network. Retrieved April 1, 2014. ↑ Riley, Marcus (March 31, 2014). "Chicago House Music Legend Frankie Knuckles Dead at 59". NBC. Retrieved April 1, 2014. ↑ Wall, Brandon (March 31, 2014). "Chicago icon, Godfather of House music Frankie Knuckles dead at 59". Chicago Sun-Times. Retrieved April 1, 2014. This page was last changed on 26 August 2015, at 06:07.